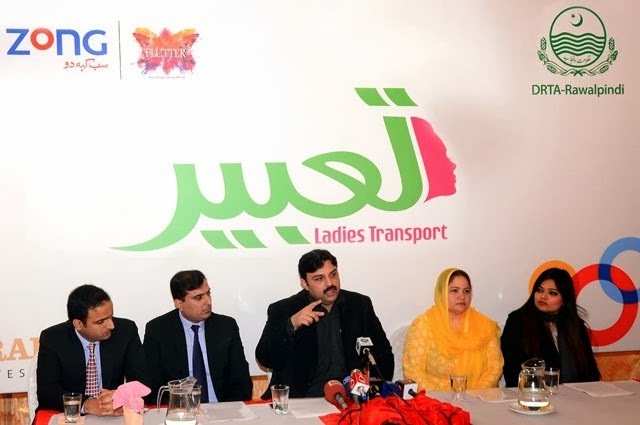 District Regional Transport Authority (DRTA-Rawalpindi) launches an exclusive van service for women in Rawalpindi. Al-Abrar Associates joins hand with DRTA and Zong Telecom sponsors the Tabeer Women Van Service. Women van service will be starting from 17 Feb, 2014. Initially 12 exclusive branded Vans will facilitate women on two PSV routes in twin cities (Rawalpindi and Islamabad). Each van will carry 16 passengers and the service will be available from 7am to 7pm. Tabeer Van will provide service on two existing Urban-Wagons routes ie. Route No.1 and Route No. 7, the bus stops will be same. Stops: Haider Road Saddar, GPO Saddar, Railway Station, Marrer Chowk, Moti Mahal, Committee Chowk, Waris Khan, Naz Cinema, Central Hospital, Sadiqabad, Rehmanabad, Shamsabad, Faizabad, Zero Point, Fire Brigade, Abpara, Melody, GPO, Poly Clinic, F6/1, Super Market, Pak Secretariat. Stops: Haj Complex, Golra Morr, Kohinoor Mil, Pir Wadai Morr, Chur Depot, Charing Cross, Radio Pakistan, Race Course, MH Chowk, Railway Station, Kamran Chowk, Marrer Chowk, District Courts, Morgah Morr, Alshafa Hospital, SOS Village and Swan Camp. The main feature of Tabeer Van Service is that the Vans will be conducted by women.